-Branch- Civil Mechanical Electrical Electronics Computer Sc. Ragging is restrictly prohibited in sdimt campus..
Swami Darshnanand Institute of Management and Technology started with the vision of creating a new breed of young, dynamic and astute technicians and technocrats who are ready to face the challenges and grab opportunities presented by the forces of global technical environment. The Campus of SDIMT is situated on the bank of Upper Ganga Canal at NH-58, Delhi-Haridwar highway. 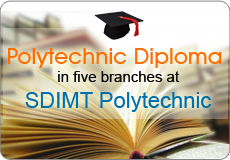 SDIMT polytechnic offers 3 year diploma course in ..